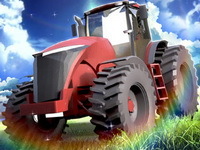 Description: Drive a tractor over obstacles. Choose your tractor and get ready for a crazy off-road race. Try to pass all obstacles and traps while keeping the tractor balanced.